Manufacturing is the process of changing raw or processed materials into items people use daily. Products from biological and medical, to metals and plastics, to food, paper, beverages and cosmetics represent just a few of the sectors of the manufacturing industry. Today, in Florida, more than 16,000 different companies and 400,000 people work in the manufacturing field! The manufacturing industry offers not just jobs, but high-wage, high-skill, high-tech careers with the opportunity to grow within the field. Forget the image of old factories and conveyor belts! Today’s manufacturing industry offers challenging opportunities to use new technology, work with teams of people and make things better for our world. If you get satisfaction from creating products in a hands-on environment, then the manufacturing industry is made for you! Courses in the Pre-Engineering/Manufacturing Academy are taught in a laboratory setting using practical experiences with the tools and materials appropriate to the industry. Advanced students develop projects from vision to reality, working in teams to design, engineer and manufacture finished products. Many students will have the opportunity to compete in nationally recognized technical and leadership skills competitions through SkillsUSA. 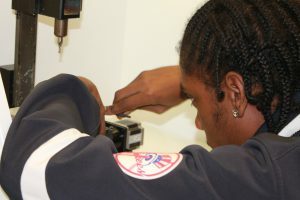 Students in the Manufacturing Academy complete a sequence of courses that can lead to Gold Seal Scholarship eligibility and articulated college credit. 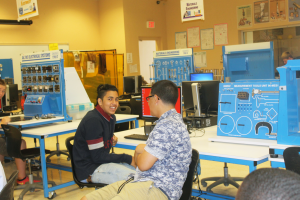 The manufacturing curriculum is aligned with Sunshine State Standards and offers students the opportunity to earn industry certification as a Manufacturing Production Technician through the nationally recognized Manufacturing Skill Standards Council (MSSC).